An anecdote I heard at the opening Talk of the Madras Week celebrations on Sunday was both heart-warming and a great lesson in humility. 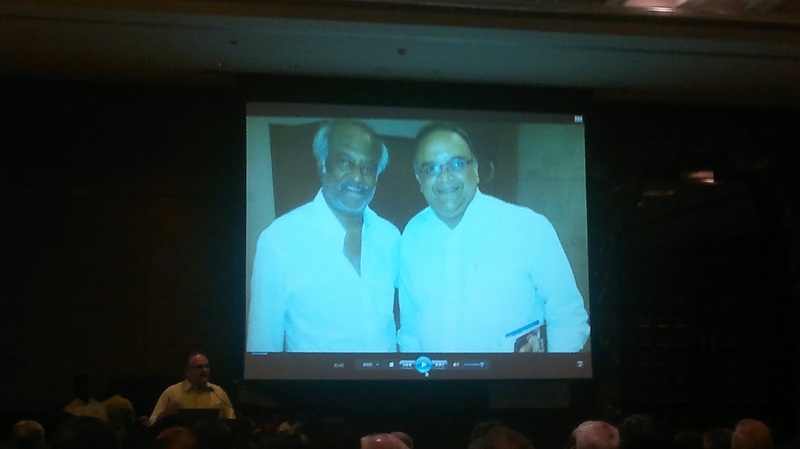 The Talk, “Chennai (Madras) and Rajnikanth”, was delivered by the famous actor and film historian Mohan Raman. It was a wonderfully presented story of the Life and times of the legend divided interestingly by Raman into eight parts: Rajni’s youth, his evolution in The K.Balachander (KB) School, his early years as a villain, his ascent to hero-status, his maturity as an actor, his attaining Super Star cult status, his role as a worldly, family man and his spiritual pursuit. Tales abound in Chennai’s Kollywood of Rajni’s down-to-earth demeanor in public Life. But the one that Raman shared was new, untold and very, very inspiring. The story goes that the (then) 8-year-old nephew of Kavithalaya Krishan (a popular actor and key functionary in legendary director KB’s__who ‘launched’ Rajnikanth in Apoorva Raagangal in 1975__Kavithalaya Productions) had come down from Australia and was pestering Krishnan for arranging to meet his (the boy’s) idol Rajni. Rajni had already become a cult figure and though Krishnan had known him well, in Rajni’s early years in Kollywood in the late 70s, he was not sure it would be appropriate to recall those times and get his nephew an audience. But since he worked in KB’s office, Krishnan knew key people in Rajni’s office as well. So, in a few days, an appointment was arranged for the young nephew to meet the Super Star. Krishnan drove the boy and his mother (Krishnan’s sister) to the studio where Rajni was shooting on the appointed day. But Krishnan, not sure if Rajni would recall him, and besides not wanting to impinge on the star’s time, decided to sit out in the car in the parking lot. Only the mother and son went into the studio and the meeting went as planned. The young fan was delirious with delight. Pictures were taken. And, finally, as they were bidding goodbyes, Krishnan’s sister decided to “brag” about her brother’s connection with the film world to Rajni. When Rajni heard that she was was Kavithalaya Krishnan’s sister, he made warm enquiries of his ‘old friend’. Through the conversation that followed Rajni gleaned that Krishnan was waiting in the car. Expressing shock and surprise, Rajni asked his personal assistant to invite Krishnan in and received him warmly – “just the way you would reconnect with a good old friend”. Krishnan replied matter-of-factly that he didn’t want to ‘disturb’ the star. Krishnan, reported Raman in his Talk, was left speechless and in tears. Irish wirter C.S.Lewis (1898~1963) once said: “Humility is not thinking less of yourself; it is thinking of yourself, less!” I think the folklore from Rajnikanth’s Life reminds us yet again to not get carried away by the trappings of success, fame and money – all of which are impermanent – in the course of our lifetimes. Indeed. It is never really about what you are or how much you are worth. What matters is who you are. If you stay grounded, no matter how high you rise, you will have a special place in the hearts of people that continue to remember you – long after you are gone! To be sure, what people will remember you for is how did you lead your Life, how many lives you touched, and, if you at all left this world a better place than you found it – and not necessarily for the millions you made! !